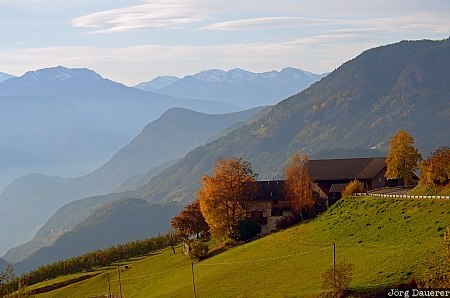 Autumn colors and the peaks of the Dolomite Alps near Bolzano (Bozen) illuminated by warm evening light. Bolzano is in Trentino-Alto Adige (Südtirol) in northern Italy. This photo was taken in the afternoon of a sunny day in November of 2011. This photo was taken with a digital camera.